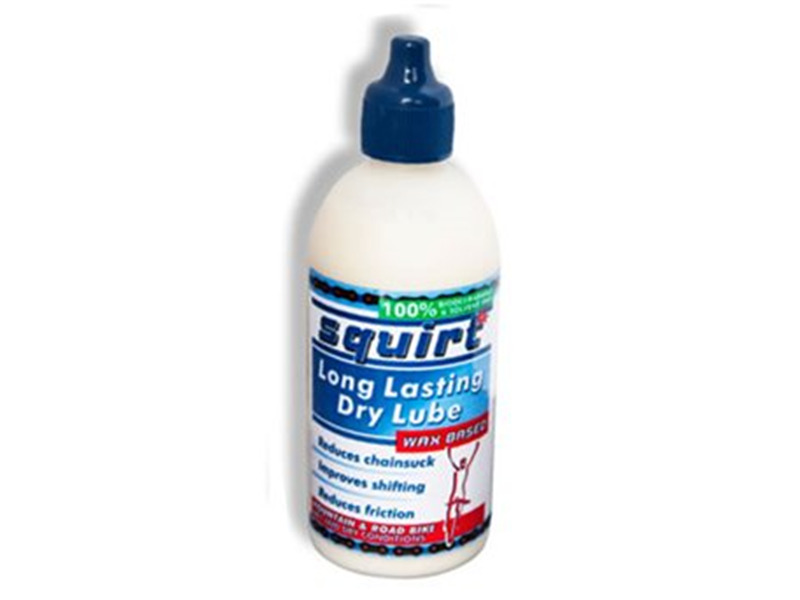 Long-lasting Squirt Dry Lube does not gather dirt. This effective wax/water emulsion improves shifting, reduces irritating dry chain noise, and prolongs the life of your drivetrain by reducing friction and chainsuck. Works well in dry conditions, easy to apply. Best lube ever made. Easy to apply and lasts along time. I have been mountain biking here in t.he AZ desert for 25 years and have tried many different lubes, this is by far the best. Anyone who is having problems with build up, may want to make sure they did not get some of the counterfeit stuff that was distributed out of Utah. 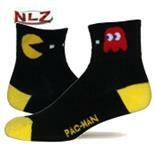 If it is real yellow in color and the cap is white and not blue, you most likely have the counterfeit. Pedro's, white lighting, motorvox, purple extreme, pro link, etc. Used this in some mud, sand and other crud and got great results. Much better than the R&R blue/yellow that I was using and way better than boeshield. So I was surprised at some of the reviews that I read - I didn't have the same experience. I was using a combination lube prior to this - first was a complete degrease, then an application of boeshield. allow to dry and then an application of blue R&R w/ a good wipedown. The reason for the boeshield first is because R&R never really penetrated or quieted down the squeaks. This worked pretty well or well enough to keep me satisfied until I tried squirt. I applied it over the chain w/o a degrease at first and got good results. Shortly after I applied it after a complete clean/degrease and I got stellar results including a quiet drive. Love not having to worry about the sand and grit and decent length of performance per application. This is the lube that I am going to be using go-forward unless I find something that is easier to work with and/or lasts longer. It's easy to apply and distributes itself well. This lube slows down shifting. 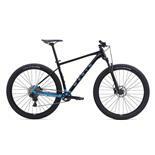 It builds up quickly on the gears, pulley wheels, rear derailleur arm, and on the outside of the inner links. It is NOT long-lasting. I was really hopeful for this lube, and thought it would be my favorite based on the reviews that it’s gotten, and the praise it got from one of the guys at the local bike shop. This lube applies easily, but it is very thick. It applies yellow, and dries clear in about an hour or so. Per the directions, I applied it heavily to the chain and spun the cranks a few times. Based on its thickness, I thought it was going to end up looking gloppy on the chain like the white lightning did. However, the next morning, the lube appeared to distribute itself evenly, and there were no glops on the chain. It did not set up as “dry” as the White Lightning. It dried to a consistency somewhere between a wet lube and a dry lube. This lube is extremely quiet for the first couple miles. It is fairly quiet for the next 10 miles. Shifting was noticeably less crisp than with the other 2 lubes. After about 20 miles, the chain began to make a lot of noise and shifting was noticeably affected. I was very surprised by this and did another heavy application and let it sit until the next morning. Again, the lube appeared to distribute itself well, with no glops. I experienced the same results as before. I would say this lube is only good for 20 miles for my type of riding conditions. Also, the chain and drivetrain definitely gunked up with this lube. I found that it built up more than the White Lightning. There was quite a bit of buildup on the gears, pulley wheels, rear derailleur arm, and on the outside of the inner links. It was definitely the dirtiest of the 3 lubes I tested. Obviously, I am extremely disappointed with this lube and would not recommend it. Other than the ease of application, this lube didn’t do it for me. This is just the best lube I have ever used hands down. Works like White Lightning, but last 3-4 times longer. Need to use way less also. Doesn't wash off in the rain and keeps the mud out. Previous wax-based lubes I've used don't penetrate the links. Petrol-based penetrate, but didn't last very long. Squirt does both, it's incredible. Even though it's wax-based, it's liquid, doesn't clog in the bottle and doesn't gob up when applied to a cold chain. Weird to submit a review about chain lube, but this stuff is so much better than anything else I've tried I had to hoot about it. Boeshield, ProLink, Tri Flow, etc. Works. Keeps a quiet drivetrain and doesn't cover the back of your bike in black tar spots. Works in the rain and in the dust. Greatly reduces the buildup of crud on my derailleur pulleys. I use it on my road and mountain bikes. Expensive when compared to the home brew I was using. Worth it if you want to minimize abrasive particles sticking to your chain and wearing stuff out. Good lubrification, stay as other have said. Wont come off when cleaning with soap, need real degreseaser. I only use bio dish washer soap to clean my bike, work perfectly. But not with this lube... For that i prefer Pedros Wax, if you give it time to dry it stay just as well as squirt lube, but can be clean a lot easyer! Pedros ice wax, White lightning. 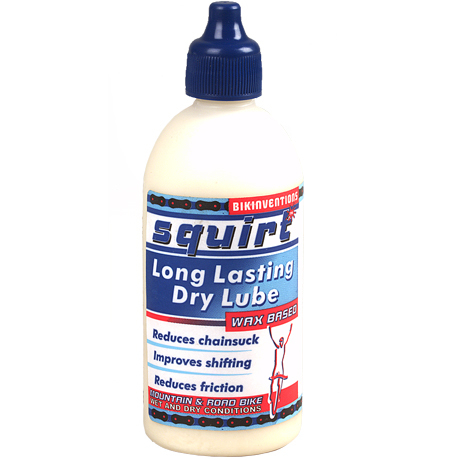 Squirt Lube is the most amazing chain lubricant I have ever used. EVERY rider in the Brck Epic seemed to be using this stuff, and these rides are long and very demanding on a drive train. 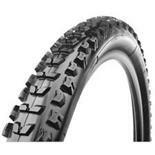 BIG rides through dry, wet, snow, streams, muddy conditions and I never relubed once during a days ride! It should be applied the eve before and allowed to dry, especially in cold conditions, but it NEVER comes off the drive train! All other wax lubes do not even come close to the performance of Squirt Lube, don't waste your money on anything else, trust me. Lasts better than any other lube in extreme dust. Non-toxic. A bottle goes a long way. It takes a while to dry. Not as clean as other lubes. The slimmy application will scare some people. Don't worry, it will dry up leaving a superior protective barrier. I needed a lube to last on the Idyllwild 24hr course during the summer. The trail has a dry "moondust" that eats drivetrains. All other lubes (Prolink, RocknRoll, White Lightning, Dumonde, Finish Line) are done after about 20 miles. Squirtlube lasts the whole ride and my drivetrain shifts better and stays quiet.